We are continuing our flooring 101 series this week and discussing one of the most important aspects of your wood floor design — the width of the planks. In truth, this is not just about the width of your floor, but the overall dimensions of your entire floor — widths and lengths. And you want to think of this not as just another ”decision,” but an important design feature that will determine how beautiful your floor will turn out. You will find that you don’t want to settle for the 2 ¼ or 3” wide boards anymore! If you are in the market for wood flooring you have probably been inundated with strip flooring options — prefinished, unfinished, character grade or select. No matter what the characteristics the floor has, most of these options have been only 2 ¼” (or maybe 3”) wide. In truth, you only really want to use a narrow width like this if you are building a parquet floor. Getting a wider board isn’t as impossible as it might seem. And with this choice you are joining the ranks of design savvy homeowners who know that wide plank flooring is growing in popularity. Just ask designer Steven Gurowitz, the National Association of Realtors, Floor Covering Weekly, MetroWest Daily News, and more. 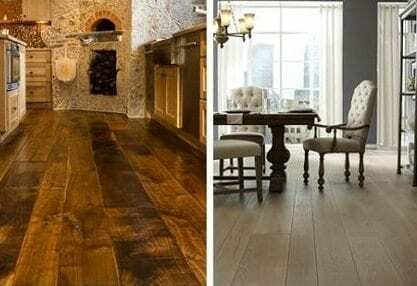 Wide Planks are “in” both for the value they add to a home, and for the beauty they can bring to the room. But what is “wide”? In the last 3-5 years, 5” boards have become the new “wide”standard. But even that won’t do if you want the best looking floor. It you want an authentic rustic look, or an upscale modern feel, even wider planks will elevate the overall value and aesthetic of your room. Random Widths or All the Same? 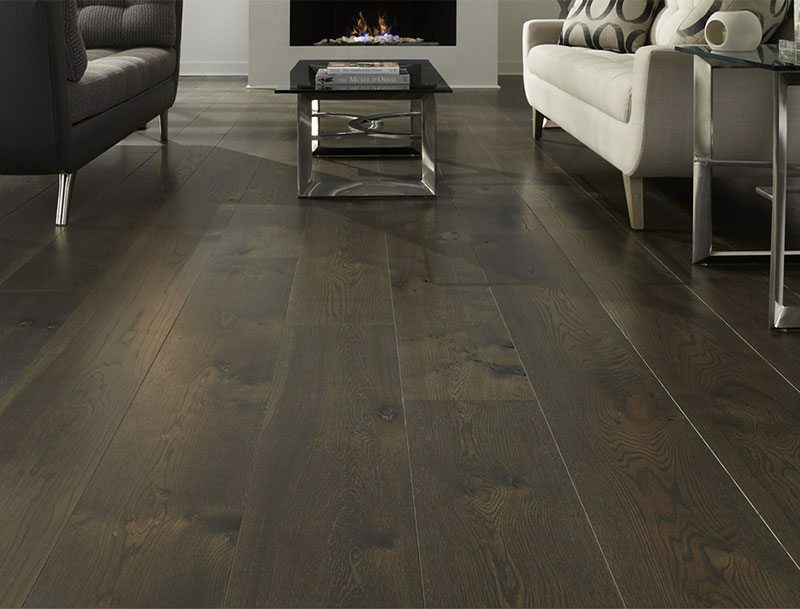 When you move beyond the standard 2 ¼ – 3” wide oak floors, there are two decisions to make. First, do you want all one width, or random widths? This is 100% a personal preference. Random widths work in any décor — rustic or modern. All one width tends to be used the most in more elegant, upscale interiors where people like a clean, consistent, linear look. Second, you must decide what widths, or width you want. There are basically width categories to choose from, depending on the manufacturer. Each of these photos represents a 3-4’ wide span. As you can see, the wider you go the fewer seams you have in the floor. In fact, if you upgrade your floor from the standard 3” strips to an average width of 8” you will reduce the number of seams in your floor by 80%! The widest boards — the 10” and above category — will naturally give you the fewest amount of seams but might not be available in every species. Many clients tend to prefer something up to 12” wide, both for aesthetics and for the simple fact that hardwood floors wider than this are exceedingly rare. Wider boards are much more common with Eastern White Pine flooring, commonly used for historic renovation, restoration, or reproduction projects. Remember, if you go wide, you’ll want to make sure you request long lengths in your floor boards too. Request an average length of 7’ for most hardwoods and 11′ for wider floors including Pine; these proportions will help visually enhance the appearance of your wide planks, and make them an impressive feature of your living area. Looking for more inspiration for a wood floor? Get our free color catalog today! Imagine the possibilities and choose from a rich variety of wood types, textures, colors and characteristics to design your Carlisle Custom floor all with personal attention and assistance every step of the way.